Thomas Sarrantonio and Harry Orlyk, both plein air painters, create in an ‘in-between’ space, a difficult place to describe, where multiple states of being and movement become melded into one. It is neither purely here in the subject nor there in nature but somewhere ‘in-between’ that the artist and nature are both participants, where the outer and the inner become a ‘one’, a vortex breathing life onto a canvas that is in a sense painting itself, the artist a conduit. When standing in front of their canvases the viewer becomes aware of the creator as being both in his center while at the same time being immersed in and a part of the nature surrounding him. We feel the movement of their materials, the paint and brush, as they fiercely push it around before their hand might come to a halt, mirroring the evanescent changes of light, wind and temperature surrounding them. It is the locus of Being where nature is an active participant in the painting and the artist is an active participant in nature while Time seems to be directing their ‘play’. With ever changing brushwork they both create surprising surfaces, highly textured, each in their own unique voice. 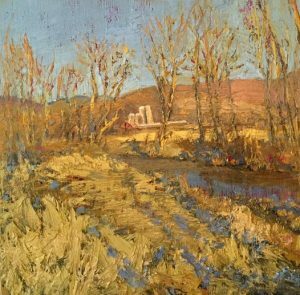 Harry Orlyk, enmeshed in the stories and histories of Washington County NY where he lives and works, invests his ties to the land into painting moment by moment where the spontaneity of his brush work and use of color create unexpected surfaces and spaces filled with light, color and daring. One gets the sense that he is not only surprising the viewer but himself as well. His mark making seduces us with its unpredictability, thickly textured paint, so palpable and dense, that one would hardly expect the luminous transparency emanating from his canvases to be possible. Yet there we are bedazzled by the passion of this visual diarist committed to recording, day by day, his loving relationship to the micro and macro temporal changes of his daily, seasonal and yearly exposure to light, encapsulating both uniqueness and eternal recurrence. “Every day has its own face”. Working in plein air forms the basis for Sarrantonio’s painting practice. 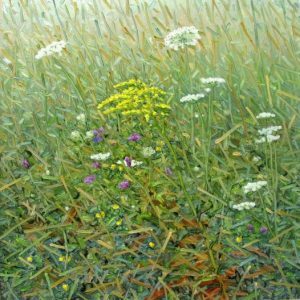 By isolating small segments of grasses as he does in this body of work he finds many layers of opposites as he paints passionately. The chaotic growth in which he also finds order is shared with the viewer through the repetition of his brush strokes which become both representations of what he sees as well as being pure brush marks on his panels. These spontaneous strokes flying across the painted surfaces mirror the movements of the natural world making us conscious of the difference. Unlike the Hudson River school painters who point to the transcendental world of the Sublime Sarrantonio’s practice is a mode of self conscious existence which passes itself on to the viewer who can’t help but see the departure he has taken from traditional landscape painting opening up both for new ways of seeing. North River Gallery is located in the village of Chatham at 34A Main Street, Chatham NY 12037. 518-392-7000 . gallery hours Friday 12 – 7pm, Saturday 11 am – 5 pm, Sunday 10 am – 2 pm. northrivergallery@gmail.com The gallery focuses on contemporary landscape art. The North River was the name given to the present day Hudson River by the Dutch in the early 17th century. Although the name has disappeared over the years the beauty of the historic artwork inspired by the area surrounding it has stood the test of time. For more information visit http://www.northrivergallery.com or contact gallery owner Telisport Putsavage at 202-466-3700 or twp@northrivergallery.com for details.